Jarvis Tyner (born July 11, 1941) is a executive vice chair of the Communist Party USA and a long-time member of the party's national board. As a leader of the CPUSA Tyner has been an active public spokesperson against racism, imperialism and war. He has written numerous articles and pamphlets and appears on the media, campuses and in other public venues advocating for peace, equality and the socialist alternative. He currently resides in the Inwood section of Manhattan, N.Y., is married and is the father of four adult children. Tyner was born in the Mill Creek community of West Philadelphia in 1941 and graduated from West Philadelphia High School. Jarvis Tyner joined the Communist Party USA, through the civil rights movement. At 20 I was a strong supporter of the civil rights upsurge that was sweeping the country. I was also just starting out my working life in the printing industry and eventually joined the union movement. In my civil rights activity, I was impressed by the dedication of many activists, Black and white, and those who stood out the most were members of theCommunist Party USA. I joined the Party because I felt it had the best understanding of how to win full equality for all. I could see that Marx, Engels, Lenin and our own great American Communists, offered solutions to the seemingly intractable problems of poverty, racism and war. The Party today continues its long commitment to anti-racism. The stronger the Party becomes, the closer we will be to the goal of freedom that the African American people, and all other people of good will, have been for. Tyler joined the Communist Party USA at the age of 20. After several years working in various industrial jobs in the Philadelphia area, where he was a member of the Amalgamated Lithographers and the Teamsters union, he moved to New York in 1967 to become the national chair of the W.E.B. DuBois Clubs of America, and later founding chair of the Young Workers Liberation League. Jarvis Tyner was the Communist Party USA candidate for vice president of the U.S. in 1972 and 1976, running with party leader Gus Hall. As a child growing up in my mother's West Philadelphia beauty shop, I heard the name Paul Robeson frequently. Robeson was held in high esteem. In our tight little African American working-class community where everybody was struggling to survive, Robeson was a national hero. Throughout the '40s, '50s and early '60s, the name Robeson was like magic to us. He was what Black leadership was supposed to be like. And the more they tried to persecute him, the stronger our support for him grew. Indeed, the fact that they persecuted him proved his greatness to us. My siblings and I were just one generation removed from being sharecroppers in the South. It gave us hope and the energy to struggle, as we heard that a Black man of his stature was a fighter for his people. Furthermore, when he was red-baited, our instinct was to reject redbaiting and the redbaiters. I remember wanting to be like Paul because he stood up to racism and was for the common person. He didn't give in or give up. I wanted to contribute to the struggle and, after my radicalization in the civil rights movement of the late '50s and '60s while in my early twenties, I began to work with the Communist Party. In 1964 Tyner was a speaker on a program to honor Alexander Trachtenberg who was then the director of the Communist Party's International Publishers. After completing my little speech, I sat down and a thunderous applause filled the room. "Wow," I said to myself, "was I that good?" Actually it turned out it wasn't that. The thunderous applause was for a giant of a figure who had entered the room unexpectedly. That figure was Paul Robeson. My mouth dropped and that good feeling you get in the presence of a great leader overwhelmed me. He shook the hands of every one on the dais including mine. I was honored. I was also stunned. He took the mike and expressed his pleasure at being there. He greeted Trachty (as he was called) and spoke of how happy he was to be back home from Europe and that he was as dedicated to the struggle then as he ever was. To prove that he was the same Paul, he sang a verse or two of Deep River. That basso profondo voice filled the room and the audience was enthralled. As a 23-year old idealistic man, I was in Communist heaven. Jarvis Tyner, National Chairman of Young Workers Liberation League was named as a sponsor of the Communist Party USA dominated National Anti-Imperialist Conference in Solidarity With African Liberation held at Dunbar Vocational High School, Martin Luther King Drive, Chicago, October 19 to 21 1973. In the early 1990s, Jarvis Tyner was chair of the Communist Party USA Political Action Committee. In May 1992 the Communist Party USA newspaper Peoples Weekly World published a May Day supplement which included a call to "support our continuing struggle for justice and dignity"
Endorsers of the call included Jarvis Tyner, NY, NY. In July 1996 Tyner visited Vietnam to attend the 8th Congress of the Communist Party of Vietnam. In March 1998 “Endorsers of the Call” to found a Black Radical Congress included Jarvis Tyner, Communist Party USA. In 2000 Jarvis Tyner served on the Coordinating Committee of the Black Radical Congress. Tyner was a founding member of the Black Radical Congress and served on its national coordinating committee for five years. At the 1998 Black Radical Congress in Chicago, a panel was convened on "Black Radicalism, Black Workers and Today's Labor Movement"
10th Anniversary Meeting of the Black Radical Congress, “Forging a Black Liberation Agenda for the 21st Century” Black Radical Congress, June 20-22, 2008, St. Louis, Missouri. 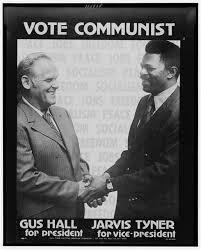 Endorsers for the Congress included Jarvis Tyner, Communist Party USA. On March 30 2002 the Communist Party USA paper People’s Weekly World called for a national holiday in honor of late Farm Workers Union leader Cesar Chavez. The article was followed by a long list of endorsersincluding Jarvis Tyner, Almost all endorsers were confirmed members of the Communist Party USA. A Communist Party USA delegation to China and Vietnam returned to the United States on Dec. 12 2006, with a "wealth of political and cultural experiences they say they hope to share with the U.S. public in order to build better understanding and friendship between the peoples of the U.S., China and Vietnam." The delegation, made up of National Chair Sam Webb, Executive Vice Chair Jarvis Tyner, International Secretary Pamella Saffer and Labor Secretary Scott Marshall, visited at the invitation of the Communist Parties of China and Vietnam. In China, they were hosted by the CPCs international department and were able to meet with leaders of the All China Womens Federation, the All China Federation of Trade Unions including a leader of the now famous Wal-Mart union and other leaders, party members and everyday citizens. The delegation then traveled on to Vietnam. While the CPUSA has sent people to Vietnamese party congresses, and Tyner himself had visited Vietnam in 1972 while bombs were falling, this was the first official CPUSA delegation to ever visit. They described it as a moving experience. Saffer and Webb both said that relations with between the CPUSA and the Chinese and Vietnamese parties had been further strengthened, and they look forward to building even stronger relations in the future. Jarvis Tyner, co-chair of Black Radical Congress, Khalil Almustafa of Uptown for Peace and Justice, Dorothy Benton Lewis, co-chair of International N, COBRA, Hank Williams of CUNY, Freedom Road Socialist Organization, LeShane Lindsey, Labor Organizer for Local 1199 and Bill Perkins, New York State Senator Dist. 30 representing Harlem and West Side were speakers on the Today's Black Agenda: Fighting for Full Employment and Social Justice under the impact of War and Globalization panel sponsored by Black Radical Congress at the Left Forum. The forum was held March 9 - 11, 2007 at Cooper Union College, New York City. In 2008 Communist Party USA leader Jarvis Tyner criss-crossed America, rallying party members, converting wavering Democrats and building support for Democratic presidential candidate, Barack Obama. It's time to stand up and be counted if you're a Democrat in Maine. Yes, I'm a registered Democrat and have had periods of actual participation in Party activities over the years...But I've made up my mind for Obama and I will stand for him at the caucus on Sunday. I'm sold not because I put any special weight on the CP, but because I do believe in social movement, as Tyner helped me understand. In 2009 Jarvis Tyner was a member of the Committee to Celebrate the Life of Luis Miranda Rivas. On October 31 2009, Latinos For Peace issued a statement calling for “no escalation of the war in Afghanistan and for expedited withdrawal of U.S. troops from Iraq and Afghanistan as well as an end to the coup government in Honduras”. More than 100 activists endorsed the call, including Jarvis Tyner, New York. 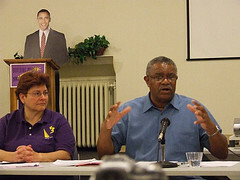 Jarvis Tyner, executive vice chairman of the Communist Party USA, spoke to 70 people at Missouri University's Ellis Auditorium in mid November 2009 and said the election of President Barack Obama opens the door for the left wing, which he feels has allowed itself to be pushed to the sidelines and overcome with progress-impeding cynicism, to mobilize. "He's only the beginning," Tyner said. "I think he's a transitional president. I think somebody else is going to come in and take it even further." Although the president is neither a communist nor socialist, his administration marks the country's movement away from the right-wing governments that have been dominant in the U.S. since the Reagan administration, Tyner said. He said that while the Democratic Party is not without blame, the Republican leadership has been the source of the nation's problems that include an increase in poverty, a ruined economy, the continuation of global warming, impeded scientific research and the destruction of public schools by No Child Left Behind. Tyner said he and his party are not completely satisfied with the work Obama has done since taking office, listing the need to withdraw troops more quickly from Iraq, for initiatives to end nuclear weapons and to re-establish trading relations with Cuba. He said the next step for the Communist Party USA is to move more into the mainstream. "We're not ready to run for president, but we are ready to run for City Council, school boards. And we're going to do that more," Tyner said. Communist Party USA members Estevan Nembhard and Jarvis Tyner support Bill Thompson 2013. ''Jarvis Tyner is the former executive vice chair of the Communist Party USA, a position he stepped down from at the CPUSA’s recent 30th National Convention. He was a founding member of the Black Radical Congress and served on its national coordinating committee for five years. In 1967 Tyner become the national chair of the DuBois Clubs of America, and later founding chair of the Young Workers Liberation League (YWLL). He was the Communist Party, USA vice presidential candidate in 1972 and 1976, running with party leader Gus Hall. Tyner is an active public spokesperson against racism, imperialism and war. He has written numerous articles and pamphlets and appears regularly on the media, campuses and in other public venues advocating for peace, equality and socialism. In July 2015, Members of African American Equality Commission Communist Party USA FaceBook group included Jarvis Tyner. Closed working group for the African American Equality Commission of the CP USA. This is a space for members of the commission to brainstorm, communicate, and work through ideas between official meetings. On Apr. 26 2015, Jackie Lavalle, joined a a peaceful march against the most violent instruments of war ever created by humanity: nuclear weapons. The demonstration was sponsored by Peace and Planet: Mobilization for a Nuclear-Free, Peaceful, Just & Sustainable World. She interviewed several people. Nearly 8,000 thousand activists assembled at Union Squares Park's north side on Broadway at E 17th St. to listen to speakers and then marched up Third Ave. to the United Nations to deliver eight million signatures. Brooks Kelly, who was balancing his young daughter on his shoulders as he marched with a delegation from the U.S. Peace Council said, "I'm here for my children and their future." Diane Beeny from a New Jersey group called "The Hiroshima/Nagasaki Remembrance Committee." She was wearing a vintage t-shirt distributed at the June 12, 1982 event. "I have been active in the anti-nuclear movement a long time," she said with obvious pride, adding, "For a peaceful, just and sustainable world we also need to fight against racism and economic inequality." As the marchers assembled for their parade to the United Nations I spotted Vinie Burrows, the award-winning Broadway actress and women's activist, helping her peace associates hold up a huge banner. Burrows, who has fought innumerable battles for social justice, said it was "wonderful to be in solidarity with our Japanese brothers and sisters demanding no more war, no more nuclear weapons which result in human catastrophe like Hiroshima and Nagasaki." "I am here to connect with my fellow workers around the world-to find common ground with them-peace is important for working people because war means workers are fighting workers-war is very rarely in their interest." Jarvis Tyner, New York District chair of the CPUSA was standing tall throughout the march, greeting demonstrators and observing the dynamics of this international outpouring for peace and against nuclear weapons. Tyner, who is originally from Philadelphia and is a former union activist for the Teamsters, has just completed a pamphlet, "Black Lives Matter." For copies: NY@cpusa.org. New member phone bank Public · Hosted by Communist Party USA. We're organizing a phonebank to our new members on Saturday and we need your help. The callfire service allow you to make the calls from home, using your smartphone, laptop or deskstop. You'll get a real charge from talking to them! Aint' nuthin like it!! Please click "going" if you can make calls! Thanks! Those invited to participate on on Facebook included Jarvis Tyner. This page was last modified on 17 January 2019, at 02:01.